Updated Tuesday June 6, 2017 by Randy Pascal. The Sudbury Bantam Rockhounds got their tournament feet wet in London late last month, taking part in the 2017 Blue Devils Invitational. Coach Ben Douillette and company found themselves right around the median in the seven team grouping, posting a mark of 2-2. 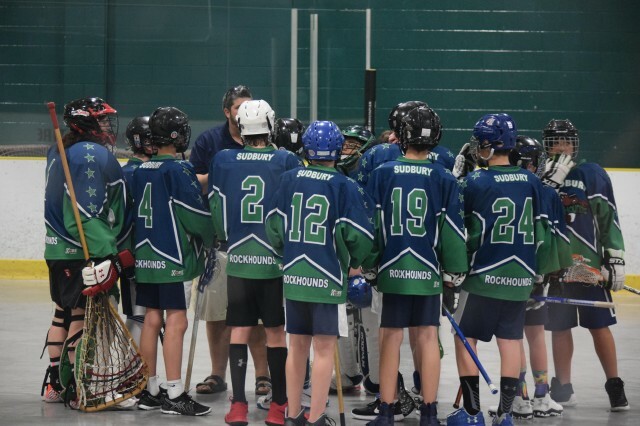 The Kingston Krossfire had their target aimed to perfection at the Rockhounds Saturday morning, downing the locals 6-1 as Ben Harris accounted for the only Sudbury scoring. Right back at it some three hours later, the Rockhounds showed little sign of fatigue, rallying from a 2-1 third period deficit and edging the Nepean Knights 3-2. Harris opened the scoring for Sudbury in the first, with Jared Eadie-Chartrand and Easton Hinschberger finding the back of the net and allowing the northern crew to pull it out in the end. Despite playing their third game of the day right around supper time, the Rockhounds improved to 2-1 with a 5-1 win over the Oshawa Blue Knights, as Harris (2), Mason Lachance, Ashton Eadie and Zac Thompson handled the offense for Sudbury. Needing a win to move on Sunday morning, the Rockhounds came up a little short, doubled 4-2 by Brampton Excelsiors as Eadie-Chartrand and Harris hit the mark for Douillette.